← Billy Dodds – “Witness for the Prosecution” and a “Smoking Gun”? It is good to see that Duff and Phelps are of an historical bent. 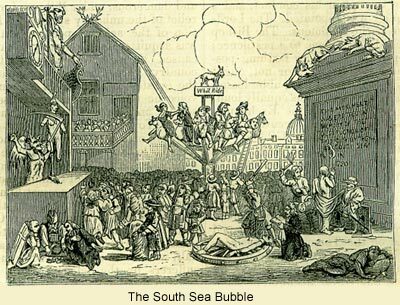 I can exclusively reveal that the terms of the CVA propsed for creditors are inspired by the prospectus for a company associated with what became known as the South Sea Bubble in 1720. It is referred to here in the Economist. “A COMPANY for carrying out an undertaking of great advantage, but nobody to know what it is”. How can any creditor resist that! When it appears, I will see if I can offer some sensible thoughts on it and the CVA process. The article brought me back to a question which has puzzled me since the administration began. If banks and financial megaliths can go totally bust, why are Rangers F.C. sacrosanct. What, other than good ol’ boyism, is there to sustain this wreck of a football club? One might have thought that they could at least die with ‘dignity’ – is that not their watchword? Buy it, strip it, flip it. Some glossy artists’ renditions of potential areas of fanbase growth (Atlantis). Proud history blah blah traditions blah blah most successful yada yada yada. Rangers bidder Charles Green has offered a £8.5m loan to buy the crisis-hit club. The administrators Duff and Phelps said that the proposed company voluntary arrangement (CVA) would result in £4.9m being made available to pay unsecured creditors. According to the report released on Tuesday, administrators claim the alternative newco route for Rangers would result in creditors received around £950,000. Mr Green’s Sevco consortium has agreed to pay the £8.5m loan to cover administration costs of around £3m, as well as all creditors, which will be repaid by the club by 2020. The deal is secured against all of the club’s assets, including Ibrox stadium and Murray Park. The last sentence seems rather strange. I am getting a sense of de ja vu here. …its simple…we (the U.K) need to keep Rangers F.C* in business. No more to be said. They are just that important…so it seems.